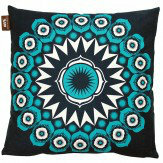 A fresh, modern, contemporary twist on retro design, perfect for modern homes. Made in the UK by nice people! 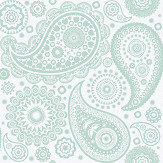 A beautiful paisley design with quirky detailing within the design itself. Detailing includes houses, birds and bicycles. 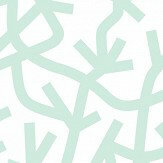 Shown here in pale verdigris and white . Please ensure you order a sample to appreciate the true beauty of this design. This design has a half pattern match. An all over wallpaper design featuring various circular motifs with intricate detailing- perfect for that Retro feel! 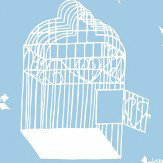 Shown here in chalkhill blue and white. Other colourways are available. Please request a sample for a true colour match. 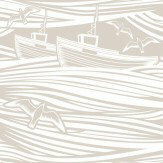 An iconic wallpaper featuring a stylised design of boats on rolling waves in Whitby bay. Shown here in lido and taupe. Other colourways are available. Please request a sample for a true colour match. 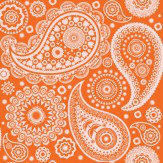 A beautiful paisley design with quirky detailing within the design itself. 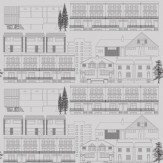 Detailing includes houses, birds and bicycles. Shown here in tangerine orange and pale pink . Please ensure you order a sample to appreciate the true beauty of this design. This design has a half pattern match. An all over wallpaper design featuring various circular motifs with intricate detailing- perfect for that Retro feel! Shown here in harvest orange and taupe. Other colourways are available. Please request a sample for a true colour match. 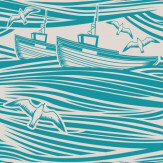 An iconic wallpaper featuring a stylised design of boats on rolling waves in Whitby bay. Shown here in awning red and taupe. Other colourways are available. Please request a sample for a true colour match. 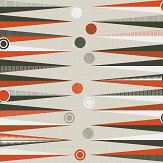 A retro wallpaper inspired by the 1951 Festival of Britain. Shown here in various colours on a pale grey background. Other colourways are available. Please request a sample for a true colour match. 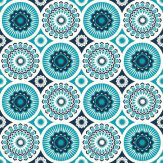 An all over wallpaper design featuring various circular motifs with intricate detailing- perfect for that Retro feel! Shown here in mustard and taupe. Other colourways are available. Please request a sample for a true colour match. 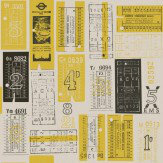 A fun retro wallpaper featuring various vintage style bus tickets. Shown here in cream and mustard. Other colourways are available. Please request a sample for a true colour match. 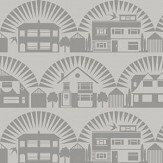 A fun and retro wallpaper featuring an all over, stylised design of various houses. Shown here in concrete and black. Other colourways are available. Please request a sample for a true colour match. 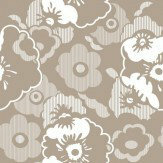 A retro wallpaper featuring a large scale floral pattern. Shown here in weathered cedar. Other colourways are available. Please request a sample for a true colour match. A iconic wallpaper featuring a stylised design of boats on rolling waves in Whitby bay. Shown here in stone and white. Other colourways are available. Please request a sample for a true colour match. An all over wallpaper design featuring various circular motifs with intricate detailing- perfect for that Retro feel! Shown here in various shades of grey and white. Other colourways are available. Please request a sample for a true colour match. 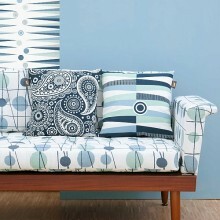 This latest collection is a true insight into the Mini Moderns designers. All of the vibrant design within this collection reference music, art, films, cult television and much more, which each of the designers enjoyed, whilst growing up in the North of England during the 1980s. Available in the brands signature colour palette, including tangerine orange and lido, each of the designs is the perfect retro addition to any interior schemes! 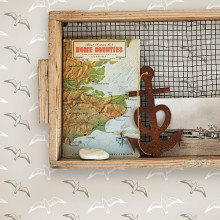 Inspired by the South East coastline and a stylish beach hut in Dungeness, this latest collection is packed with seaside charm. 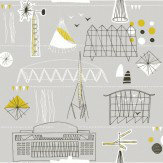 Designs include seagulls, feathers, peg boards and motifs of various landmarks in Dungeness in a range of vibrant contemporary colours, as well as subtle more muted zones for a calmer look. A fun and vibrant collection of cushions, these are perfect for that finishing touch to any room, or for adding a splash of colour! 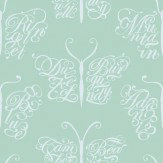 Designs range from the ever popular Whitby design to the vibrant Pet Sounds. 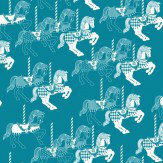 Many of the designs either match or compliment the wallpapers and bedding from Mini Moderns. 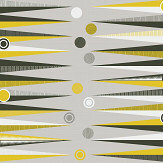 We are delighted to bring you this collection of modern day retro wallpapers from Mini Moderns. These fun and quirky designs are inspired by many different influences including travel, vintage toys, childhood memories and everything British! 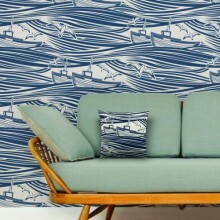 The Whitby design is a coastal escape of small boats on rolling waves, whereas the Hold Tight design is a walk back through time with vintage London bus tickets given a modern twist in contemporary colours. 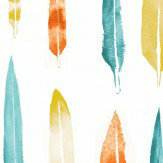 This is the perfect collection to add personality to your walls!